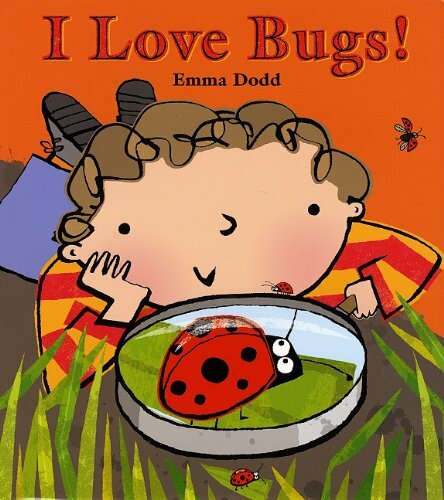 Author and illustrator, Emma Dodd, brings bugs to a whole new level. I Love Bugs! introduces the reader to a variety of insects using fun, figurative language. Size, color, shape, and sound... you name it! Learn the difference between each insect and discover the boy in the story's favorite bug by the end of the picnic (and yours too!). "I love springy jumpy leapy bugs and slimy crawly creepy bugs"
The pages rhyme, keeping the reader entertained... but that's not the only thing! Every page is bursting with glossy color and the most detailed cartoon beetles, slugs, and bees. Every illustration, with a combination of water color and meticulous free hand drawing, captures the individual personality of each insect, all seeming to have an adorable grin on their face. This is a great choice for all of the little scientists out there.